I chose the Bournemouth match to attend over this on the basis of travelling to Soton and back ought to have been easier (it wasn’t) without the added threat of Bank Holiday-makers. So I was left watching this on BT. Boo! You can’t knock the lovely aerial shots of the stadium which they kept showing and their studio pundits Steven Gerrard and Ian Wright were OK. Pep’s interview was all about Stones (injured or dropped?) and the return of Kompany. They then spent several minutes discussing which defenders City need this summer. No surprise – Virgil was on the list. Claude’s interview was all about the return of Manolo who had “trained well” during the week. Messrs Gerrard and Wright consider him to be the “real deal” but did not suggest he would be moving to a proper club just yet. They were big fans of Les Reed’s rec recruitment policy but both went for a City win. The commentary team was Ian Darke, Steve McManaman and Glenn Bloody Hoddle. Arrrgh! Manolo’s return saw Long benched and it was Clasie who made way for Steve Davis. Along with Stones, City also dropped Sterling, Delph and Kolarov bringing in Fernandinho, Otamendi and De Bruyne as well as Kompany – that looked a much stronger side to me. City kicked off towards the Chapel stand to the rousing strains of “wash Your Mouth Out, Son” from the Northam. It did not take long for the pattern of the first half to emerge – lots of City possession and JWP and Redmond dropping back to make two rows of four behind the ball. They made their first serious attack on 4 minutes, when Clichy overlapped down the left and knocked a cross to the back stick where Aguero was unable to convert it. Soon after, De Bruyne played the Argentinian in down the inside right channel but he drew his shot beyond the far past. On Aguero’s next venture forward, Yoshida dispossessed him and Saints worked the ball to Manolo who was clattered by Kompany. Saints quick free kick was promptly recovered by City who, even at this early stage, were seeing far too much of the ball for my comfort. On 8m Davis conceded a corner which De Bruyne hit long. It reached Aguero who volleyed wide. Saints seemed unable to retain the ball and normally reliable players like Redmond and Tadic were making errors that allowed City to keep winning it back. Each time they lost the ball Saints dropped back towards their own goal – too deep I thought. It was not easy to watch. On 14m Saints finally mounted an attack by intercepting a pass allowing Redmond to break forward. His neat pass found Manolo on the left and the Italian deftly picked out Tadic on the edge of City’s box. We’d been told that you only had to hit the target and Bravo would let it in but, sadly, Tadic took a wild swing and skied it into the Northam. 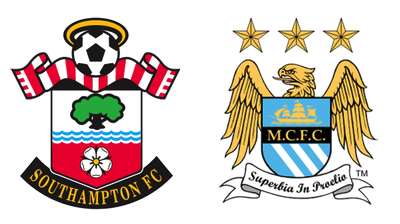 Shortly afterwards Saints saw how quickly City could break when Højbjerg lost possession. This time Saints got numbers back to prevent any damage but the warning was clear. Saints were holding City out and Cédric earned applause when he neatly chested a Navas cross down for Fraser. Although Saints began to win the ball in midfield sometimes, the overall momentum remained with City. On 19m Bertie conceded a corner which was taken short. De Bruyne’s eventual cross was forced away but City soon sent the Belgian away on the right and Maya put it behind for another corner. Fernandinho rose to meet this cross but his header missed the goal. Saints enjoyed a few minutes possession without creating anything before City returned to the offensive. Silva and De Bruyne kept probing but Saints defended well so that Fraser was not seriously tested. Cédric seemed to have Sane under control but the movement of Clichy and Silva still created openings down our right. On 28m De Bruyne got a shot away but Saints bodies prevented it threatening Fraser. On 29m a ball played up to Redmond was allowed to drift out of play. Charitably, Navas’ foul throw returned the ball to Saints but we were unable to capitalise. Højbjerg received a yellow card on 31m for a late tackle. City continued to hog the ball with Saints sitting in but on 34m we won it and moved forward – then we lost it again. With rare space to run into Aguero charged down the left but Cédric matched his run, tackled and cleared. Saints then mounted an attack. A lovely move saw Tadić crossing and Bravo punching the ball clear. Cédric recovered it and fed JWP who crossed from the other flank. I didn’t see who headed it out but the ref determined goal kick. City quickly broke forward allowing Aguero to chip the ball across our box. It was met by Silva who shot wide. A minute later came BT’s big talking point – Fraser dived at the feet of Sane and Mr Swarbrick said corner. The BT pundits all decided Fraser had brought the German winger down and it should have been a penalty. Interestingly, MOTD took the exact opposite view – Fraser had got fingers on the ball to nudge it behind. You’d never see Saints getting a penalty for that so why should any other fecker? Toure met the corner and headed wide. Then, on 39m, Saints won a corner at the other end. A rare Saints attack saw a Højbjerg shot loop off a defender and although Bravo rose to collect it he was adjudged to have been over the line. Again Bravo got a fist to the cross sending the ball out for a throw. Saints then worked the ball out to Cédric who mis-controlled and City won it back. A minute later, the Portuguese became the 2nd Saint to be carded (but my notes don’t say what for). City returned to the attack with Toure winning a corner which was overhit and sailed harmlessly out. On 43m Bertie caught Aguero from behind and the little striker went down. Replays showed it was nasty (studs down the Achilles) but Bertie escaped a card. After treatment, the City #10 was able to carry on. Sane’s free kick was cleared to Silva who planted another shot wide. During the interval I put out the rubbish but Drew confirmed that plenty of rubbish was talked by the BT mob, particularly about City’s “deserved” penalty. On 47m Stephens did well to show Silva away from our goal but then crudely fouled him when the Spaniard tried to turn. This gave City a shooting opportunity. Up stepped Yaya Toure and hit his shot right at Fraser: it wasn’t much but at least it was on target – the first of the match! On 49m Kompany fouled Tadić but Saints soon gave the ball back to City. Navas then got away with a blatant foul on Redmond before Saints finally won a free-kick in shooting range when Silva fouled Davis. JWP stepped up but dragged his effort wide of the post with Bravo watching it fly past. On 53m Højbjerg gave the ball away to Silva but a saving pursuit and tackle by Davis recovered the ball – which Saints promptly gave away again! Stephens then won the ball and brought it out but was challenged by Aguero. The Argentine went over and was awarded a free kick. De Bruyne took it but his cross was headed away towards Navas. The Spaniard hit a rising drive that needed Fraser to tip it over his bar. Silva took the corner and Kompany got over Yoshida and headed the ball down and past Forster: 0-1 with 55m gone. BT advised us this was Kompany’s first goal for 20 months but as he had rarely started during that period thanks to a string of injuries this was an unsurprising stat. Meanwhile, on the touchline, Long and Boufal were warming up. On 59m they replaced JWP and Manolo – FFS! City continued to dominate possession and on 61m Sane won a corner off Cédric. Alarmingly, Silva’s kick fell to Kompany but this time City’s captain took a shot which was blocked. Then Sane set up De Bruyne who put his shot wide. Boufal led a Saints charge which floundered and City countered through Aguero. Fraser blocked him but the ball broke to Silva but thankfully Stephens got in the way of his follow-up. Fraser needed treatment following his tangle with Aguero and soon afterwards Navas was injured. Both were able to continue. On 69m Saints were gifted an opportunity when a poor defensive kick by Bravo was intercepted. The ball was played up to Tadić but the Serb tried an outrageous back-heel which Bravo was able to collect. City were immediately on the attack again, first Maya cleared a cross from the left and then Stephens cut out De Bruyne’s cross. Amazingly, with 20 m left, Saints were still in the game. Saints continued to press and De Bruyne’s foul on Bertie allowed our centre-backs to get forward once more. Otamendi won the ball and headed behind for a corner. Tadic’s kick was again headed out by the big Argentine. The third cross avoided him but whoever won it put a tame header into the keeper’s gloves. Saints continued to press with Boufal trying to pressurise Navas but suddenly the Spaniard won the ball directing it towards De Bruyne. Closed down by a couple of Saints players De Bruyne laid the ball off and turned into space. Silva found Aguero who played the ball ahead of the Belgian’s run and he was away. Only one Saints defender could match De Bruyne’s run but in the middle Sane was unmarked. De Bruyne laid the ball into his path and he slotted it past Fraser: 0-2 and a quite superb goal by City. Saints now pushed men forward and a lovely move down our left saw Boufal find Tadic but his shot was blocked and possession lost. Then on 80m De Bruyne made another burst down the wing and was found by Navas. Looking uo, he chipped the ball to the far post where Aguero headed home: 0-3 and Goodnight Nurse. City brought on Zabaleta for Silva and we brought off Long with Jay Rod coming on for the final minutes. BT showed a replay of Long being clattered by Otamendi and he appeared to have hurt his ankle. On 84m Toure fouled Jay Rod but City saw off the subsequent attack. It was obvious that the presence of Kompany had stiffened the resolve of City’s defence and we barely troubled them all evening. On 86m Sterling replaced Sane. Boufal then cut in from his wing and sent a hopeful effort over the bar. City then replaced Aguero with Iheanacho. Macca selected Kompany as BT’s MoM as the 4th official’s board showed 4 added minutes. City, and in particular De Bruyne, continued to look dangerous but nothing of note happened before the final whistle. It was a disappointing performance from Saints. At times they were outclassed by very good opponents but I wish we had shown a little more ambition while our players were fresh. Staying in the game until the last 15m was some achievement, but the gulf in class was better reflected by the final scoreline. Bring on Hull and 'Boro please. It would have been easy to select any of several City players as Man of the Match and the general consensus would probably give it to Kompany. However, in a spirit of orneriness I’m nominating Jack Stephens. He has been thrown in at the deep-end while Virgil has been out and not eased into the Premier League as Puel would have liked. The lad has done well supporting Yoshida and, whilst his displays have not been faultless, he has come up against some of the games top strikers. He has never let us down and on Saturday, against Aguero & Co, he put in another stirring display. Well done Jack!